Then follow the detailed instructions below on how to properly use the Canine HealthCheck kit. 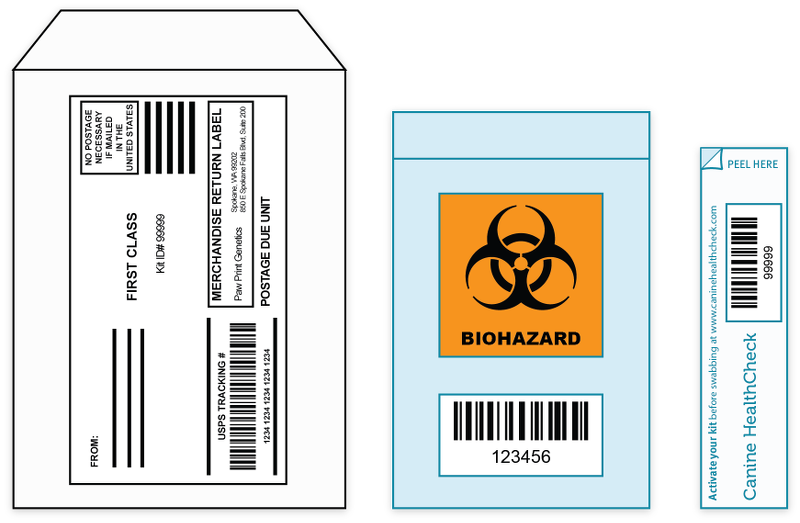 We have provided you with three labels: 1 shipping label and 2 kit ID labels. Place the pre-paid shipping label on the return mailer. Place one kit ID label on the 'biohazard' bag. 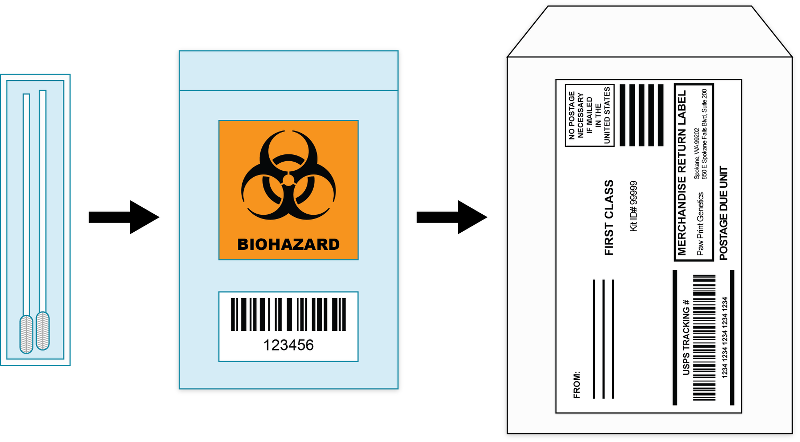 Place the second kit ID label on the swab sleeve. There are two cheek swabs included in your kit. You will swab your dog's cheek twice, using one swab each time. Wait at least 1 hour after your dog has eaten. Make sure the mouth is clear of debris. Remove one sterile swab from the protective sleeve. Be careful not to let anything touch the tip of the swabs. Insert the swab between your dog's cheek and gum. 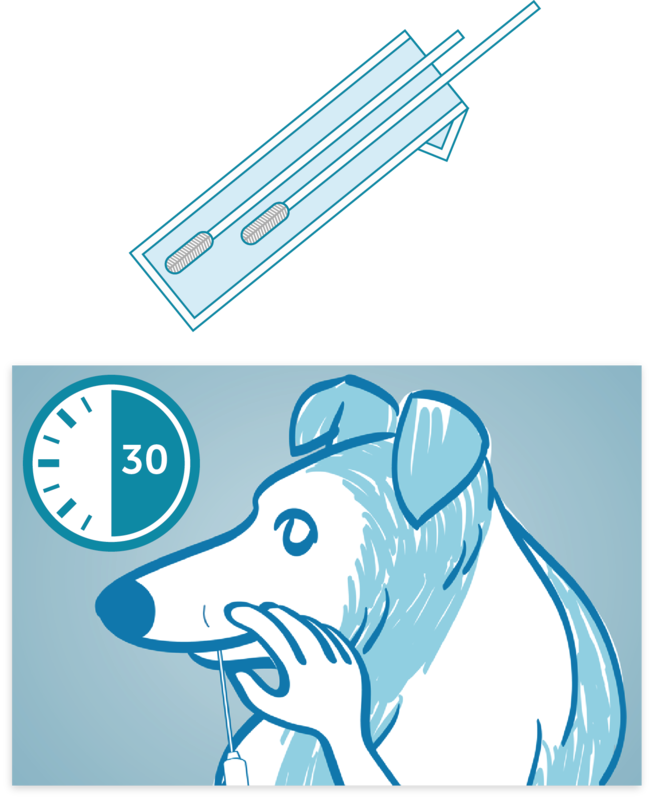 Gently press the swab against the inside of your dog's cheek. Move and roll the swab for a slow count of 30 seconds to collect the cells. Carefully return the swab to the protective sleeve. Repeat this process again with the second swab. Place the protective sleeve containing your two swabs into the 'biohazard' bag. Place the 'biohazard' bag into the return mailer. Mail your samples as soon as possible. Important! Make sure to save the additional Kit ID and USPS Tracking # for your records. We'll email you as soon as we receive your samples. We will email you again when your results are ready. Please contact us if you have any questions during the process. Please remember to recycle your Canine HealthCheck box!